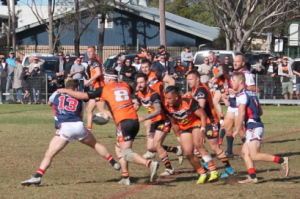 The Oaks Tigers booked their place in the 2018 Group 6 grand final after defeating Camden Rams 36-10 yesterday. 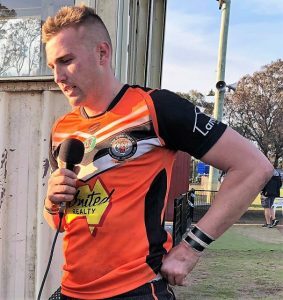 The Oaks Tigers have stormed into the 2018 Group 6 Rugby League Grand Final following a 36-10 demolition of the Camden Rams on Sunday afternoon at Thirlmere Sportsground, reports MIKE SHEAN. The Tigers will go into the decider next Sunday, September 16 at Campbelltown Stadium as underdogs, despite building up a fair bit of momentum during the finals. They will face Group Six heavyweights Picton Magpies in what will be a mammoth ask if they are to lift the Norman L Day Cup around 5pm on Sunday. Captain coach Mitchell Brasington told Macarthur Sports Radio after yesterday’s victory that the Tigers will once again be looking to their defence as a key part of their strategy against the Magpies. The Group Six 2018 Player of the Year said he knew his side has the points required to win matches, but their defence needed to be in order for 80 minutes in the decider. 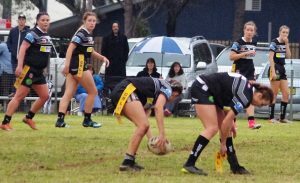 Yesterday’s preliminary final was played in blustery conditions at Thirlmere Sport Ground. Spectators were treated to a tough and physical battle and it wasn’t until the 20th minute that The Oaks roared into action. When halfback and co-coach Matthew Brasington scored the first try of the match it was the start of a nine minute blitz when the Tigers bagged three tries to race to a 16-0 lead. When Michael Brasington added a fourth early in the second half the writing was on the wall for Camden, down 20-0. But the Rams were the next to score, courtesy of Luke Peoples, and at 20-6 it gave the Camden contingent a glimmer of hope. This was quickly snuffed out by the Tigers though, who grabbed a commanding 30-6 lead after back to back tries to Mitchell Brasington and hard working backrower Josh Van Der Meulen. With just 15 minutes remaining it was all over bar the shouting, but Camden, to their credit, kept fighting all afternoon, with halfback Chris Browne scoring a try eight minutes before the final hooter. Mitchell Richards scored the final try of the day, after a long run down the Camden left by Michael Brasington in the final minute, blowing out the scoreline further as the Tigers won 36-10 to book their place in the decider against Picton. The Oaks were served well by their forwards – James Kovac, Ryan Russell, Sinopati Solia and Sean Finnerty -who regularly made easy metres up the middle of the ruck. The Oaks Tigers 36 def Camden Rams 10. Mittagong Lions 12 def Picton Magpies 10. Action from the under 18 match between Picton and Campbelltown City. Picton Magpies 42 def Campbelltown City 26. 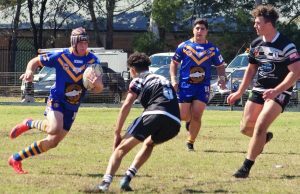 Narellan Jets 8 def Thirlmere Roosters 0. Picton Magpies 10 def City Gold 4. Campbelltown City 20 def Bundanoon Highlanders 6. Picton Magpies v The Oaks Tigers (Sunday 3pm). Oran Park Chargers v Mittagong Lions (Sunday 1.10pm). Narellan Jets v Picton Magpies (Sunday 11.30am). City Blue Roos v Narellan Jets. (Saturday 5.15pm). The Oaks Tigers v Picton Magpies (Saturday 4pm). Warragamba Wombats v Campbelltown City (Saturday 6.30pm). Saturday matches: Harvey Shephard Field, Kirkham Park, Camden.